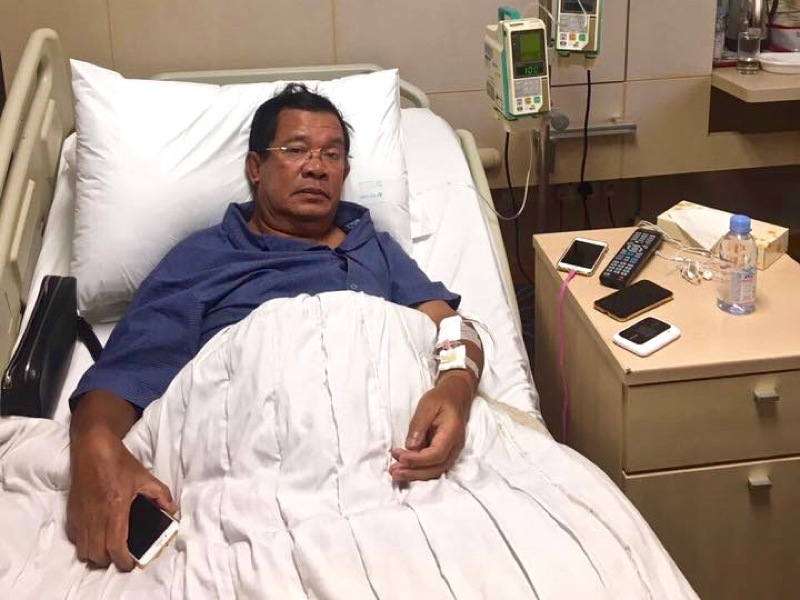 Prime Minister Hun Sen lies in a hospital bed in Singapore after suffering from a bout of ‘extreme exhaustion,’ in a photograph posted to the premier’s Facebook page on Thursday. 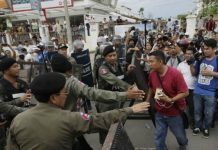 Prime Minister Hun Sen announced on Thursday that he has been hospitalized in Singapore with “extreme exhaustion” and could remain there until at least Sunday, which would mean missing a series of planned meetings with foreign diplomats, military officials and civil servants, according to a post uploaded to the premier’s Facebook page. “I ask for understanding from civil servants and armed forces in Kompong Speu province that I was going to meet with, but it has been postponed,” the post said. “[I] ask for understanding from foreign friends, especially Japan, India and France, that the planned programs for the meeting has been canceled,” the premier added. Mr. Hun Sen said in the post that he was suffering from “extreme exhaustion” and had been admitted to a Singapore hospital on Wednesday, where he is expected to remain for several days. He did not name the hospital where he is receiving medical attention. 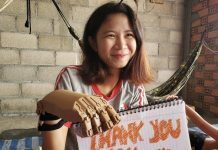 “I fell ill [and] needed urgent medical examination and treatment. 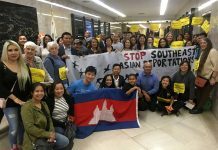 I’ve been in a hospital in Singapore from 2 p.m. on May 3 and could return to Cambodia on Sunday, May 7,” Mr. Hun Sen wrote. Phay Siphan, spokesman for the Council of Ministers, said on Thursday that the premier’s condition had been caused by a heavy workload. “He has a busy schedule of working locally and abroad and does not have time to relax,” he said, adding that the condition was not considered to be serious. Mr. Hun Sen has previously courted controversy for choosing to seek medical attention in Singapore rather than at home. In January last year, the premier said he decided to visit Singapore for his annual checkup because Cambodian doctors told him the country’s health system could not adequately provide the required care. CNRP lawmaker Mu Sochua on Thursday said that getting treatment abroad was Mr. Hun Sen’s choice to make. 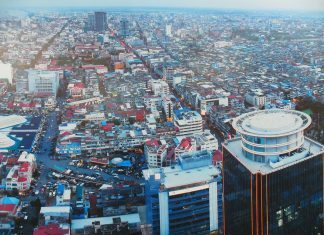 “[Mr. Hun Sen] has been abroad so it means he trusts a hospital there. I think that health issues, especially the leader’s health, is so important. Thus I wish Samdach Prime Minister to have a complete recovery soon,” she said. Mr. Hun Sen’s Facebook post attracted about 71,000 likes, 13,447 shares and 11,670 comments as of on Thursday evening, the majority of which wished the premier a fast recovery.